Collins German Dictionary is the ideal reference to help you learn, understand, communicate and extend your knowledge of the German language. 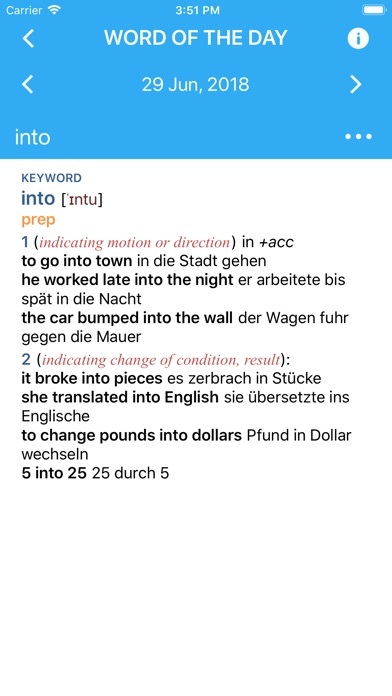 • Over 80,000 words, phrases and definitions • Comprehensive and up-to-date coverage of all words and phrases you need, and the updated for the new spelling reform German • In-depth treatment of difficult words • Cultural notes provide insight into the life in German-speaking countries This modern, user- friendly dictionary gives priority to everyday vocabulary and the language of current affairs, business and tourism. As in all Collins dictionaries, the emphasis is firmly placed on contemporary language and expressions. 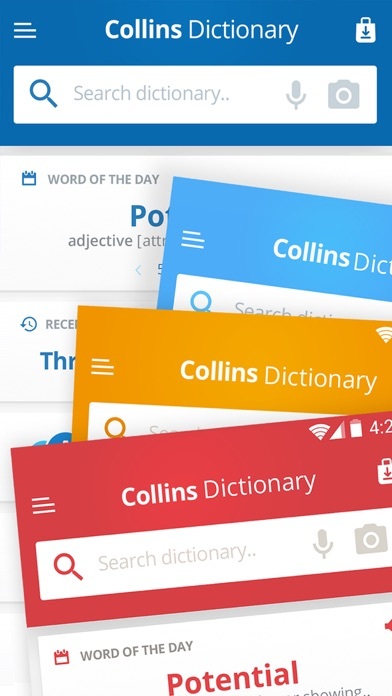 Also includes advanced search and language tools that have become the staple of quality language apps from MobiSystems, Inc. LATEST APP UPDАТES: • Learn in style with any of the four colorful new themes – The colorful layout will turn your learning experience into an enjoyable routine. Customize your dictionary and benefit from the cheerful mood your favorite color brings you. • Dive right into the intricacies of the language - With new and convenient Home page, sleeker and more intuitive visual layout, as well as innovations in the speed of searches, you can get to the desired entry faster than ever. SEARCH TOOLS - quickly find words with the clear, functional, and easy-to-use interface. Designed to provide the most comprehensive search experience, the dictionary combines several search tools to match or predict what are you looking for, including: • Search autocomplete helps you find words quickly by displaying predictions as you type. • Keyword lookup allows you to search within compound words and phrases. • Camera search looks up words in the camera viewfinder and displays results in seconds. • Voice search helps you find an entry when you don’t know how a word is spelled. Looking for a specific word but don't know how it's spelled? We've got you covered with our automatic ‘Fuzzy filter’ to correct word spelling, as well as ‘Wild card’ ('*' or '?') to replace a letter or entire parts of a word. LEARNING TOOLS - engaging features that help you further enhance your vocabulary. Designed to give you freedom to structure your studies, the dictionary combines several learning tools to help you be more organized, including: • ‘Favorites’ that allow you to create custom folders with lists of words. • Recent list which helps you to easily review looked-up words. • Swipe-to-delete functionality in the Recent and Favorites menus. • Word-of-the-day option to teach you a new word every day. Feel excited by the new word or definition you just learned? Share your discovery with friends on social media, email or any other option available on your device. Reliable and easy to use for lyric diction. I’ve never had a problem with updates, unlike Oxford products. Buy Collins. Please remove annoying review prompt. We've purchased app. Make this something we can turn off in settings. We should not be 'annoyed into' writing reviews! Not worth paying for. 1. Word of the Day is set up backwards. 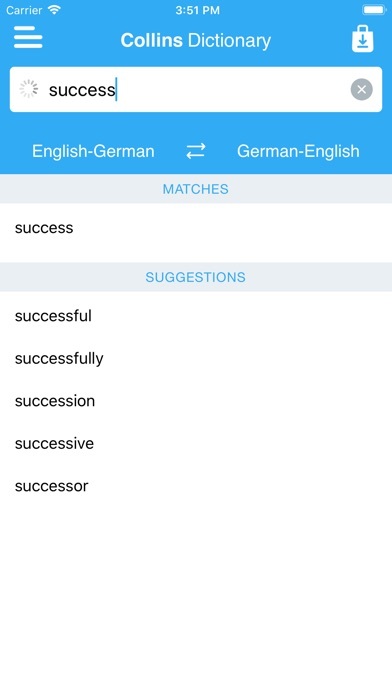 Instead of giving you a German word they give you an English word. Backwards from every other Word of the Day app I have used. 2. Bare minimum of a dictionary. For example, if you look up the word ‘boy’ in the app, it gives you only a one word translation, Junge, and absolutely nothing else. Correct, but what about the other 3 definitions and all the sample sentences that Collins’ full website has? 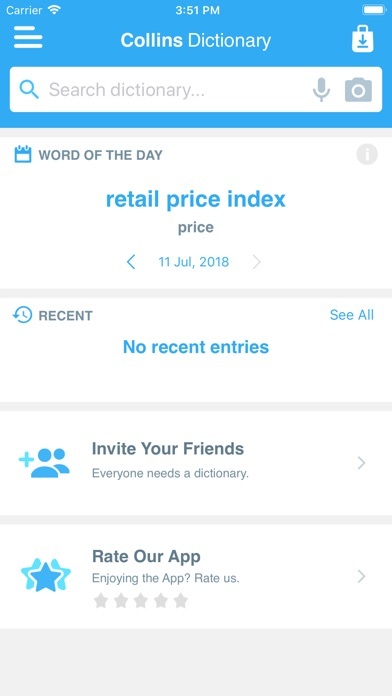 Really - 1 word on the app vs 4 complete definitions and 7 samples on the full website. 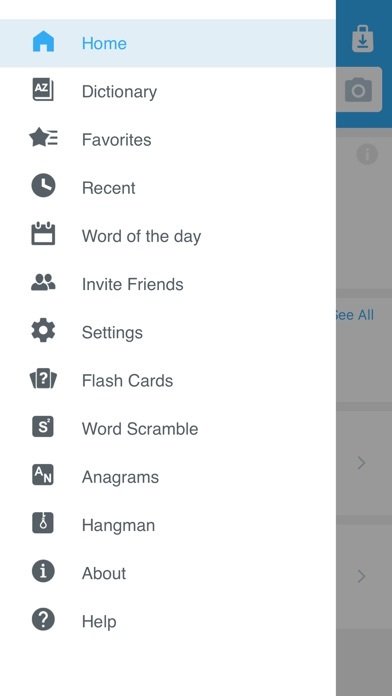 Overall, a very bare bones app - for the cost a full dictionary should be provided. Have used Collins through Spanish and German courses. It is dependable and excellent for immediate reference. Most words but missing some. Also, doesn’t provide perfect tense helping verb (hat, sein) or even corresponding past tense form of verb. Great definitions, diction (in precise IPA), and design of app. Needs work in small areas. 1. When using a Bluetooth keyboard on ipad, the app cuts off the bottom half to make space for the onscreen keyboard, even though it isn't there. 2. Could use basic hotkeys, so that one could, without having to take their hands of the keyboard, select the search bar, type their word, then use the arrow keys to select their word and see its definition. I will check back and raise or lower my rating depending on whether or not the developers are given the chance to actually continue to support the app. There is no introduction explaining the abbreviations used in the dictionary. This is essential to it's usability, but I have not been able to find it after many attempts and navigation. Seems to work now under iOS 4. Seems to work now under iOS 4. Thanks. One criticism: Saying in the app ad that it is now "Optimized for iOS 4" is a little silly. Old Review: Does not work under iOS 4. Crashes on startup under iOS 4. Was a nice (if a little pricey) program before so I hope they will update it to run under iOS 4. I hope they won't leave it broken hoping to sell the even pricier Pro version. That would be completely unethical. Downloaded this app just recently. Seems generally good and reflects the print edition of this dictionary. But unless I'm missing it, there should be a way to clear the history of looked-up words!